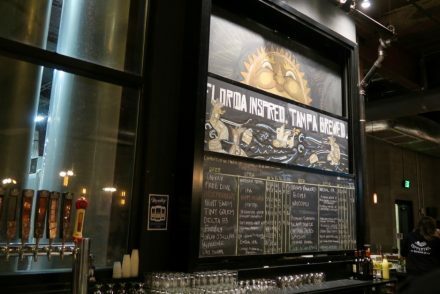 The brewpub is sandwiched in an intersectional oddity. It’s a triangular spit of land that’s surrounded on all sides by a city street, a highway, and a county road! I pulled into the parking lot a little early, primarily so that I could take photos and notes without it being rude when my friend arrived. At 5pm on a weekday I was the only car in the parking lot. 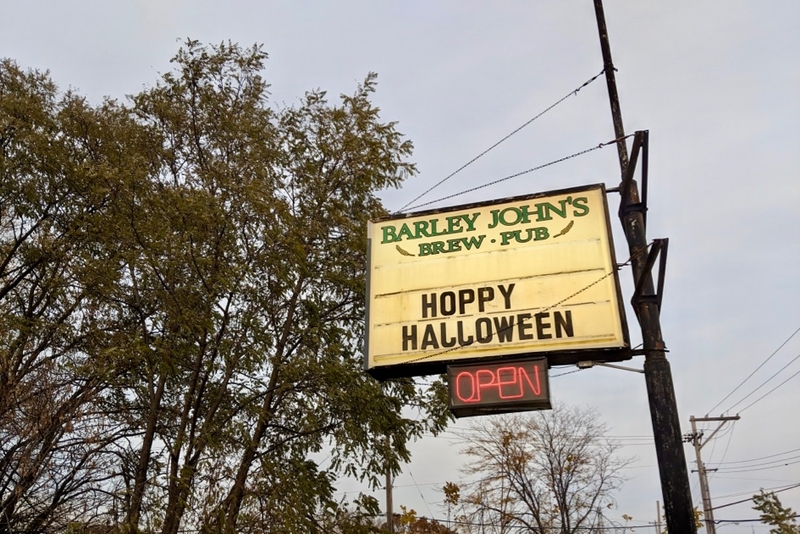 Since it was approaching Halloween (as signified by their “Hoppy Halloween” sign) it was too cold to sit outside but they’ve got a patio that looks like it would be a cozy spot. Their hop plants were looking a bit sad for late October but it seems like they would completely blanket the walls surrounding it. I took a seat near the bar at wooden table with a live edge and a cribbage board drilled right into it! Before I did anything else I snapped a photo and sent it to my brother in-law. He always plays cribbage with his girlfriend when they visit breweries so I had to share! It went in the mental vault for if there ever comes a time where I design my own taproom. 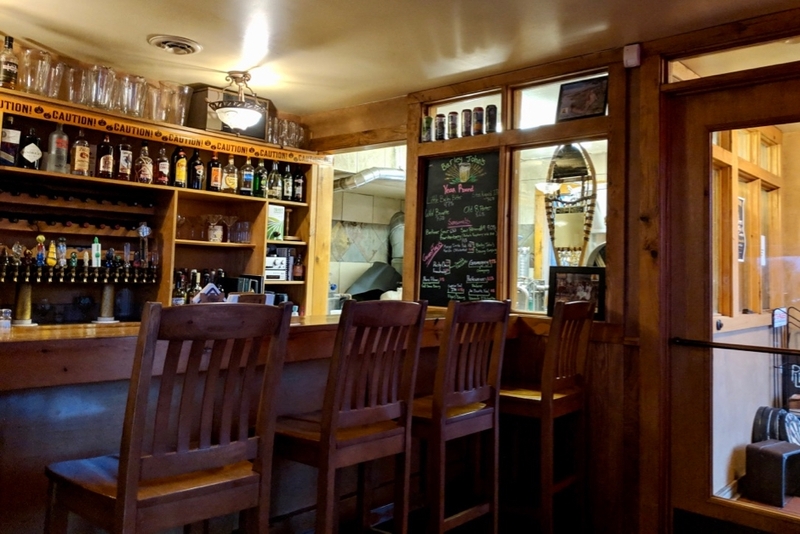 The brewpub itself is quite small. 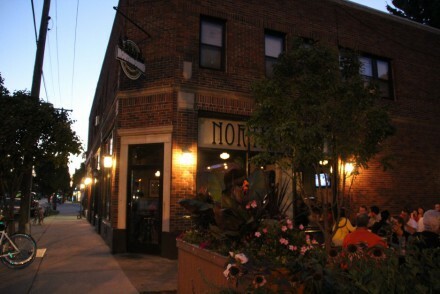 There is a dining room with ten to fifteen tables and a short wooden bar with five seats. 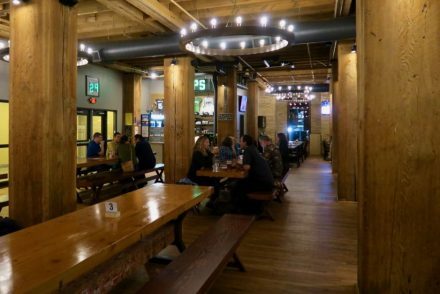 It’s truly an old school brewpub, more of a bar and grill than a trendy taproom. Once my friend arrived we put in an order for food. 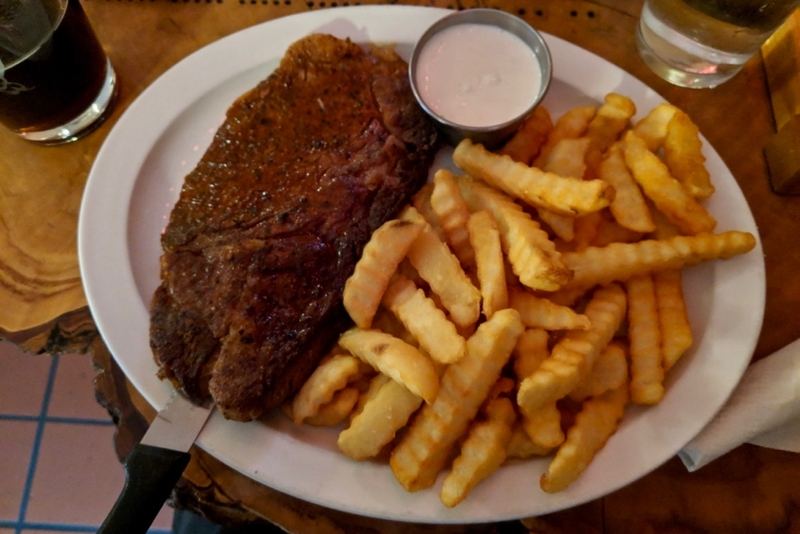 Despite the overwhelming aroma of pizza we both decided on steak and fries. While we caught up on our lives I drank a pint of Wild Brunette. 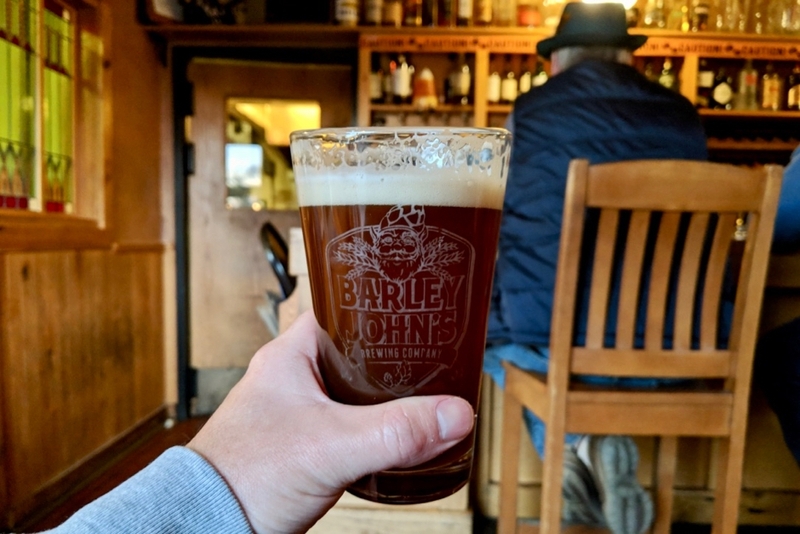 This is the beer that started it all for Barley John’s and I instantly saw why. 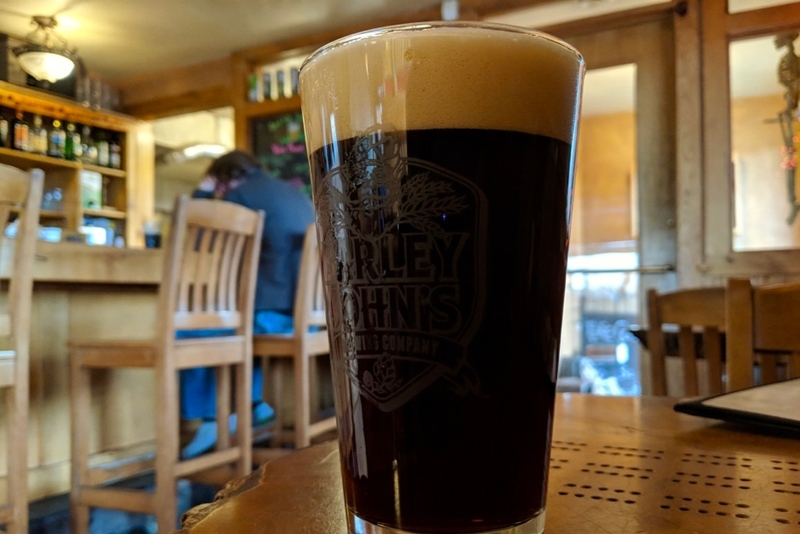 It’s brewed with wild rice which gives it a bit of nuttiness to go with the roasted malt and chocolate flavors. Very solid beer that I’d love to have again! When my steak arrived I hadn’t planned very well and was pairing it with Frankenberry, a raspberry and rhubarb wild ale. Flavor was overall very good but a bit too sweet for my tastes, not helped by my savory meal! I recovered and ordered a glass of their Little Barley Bitter. An English Bitter that instantly transported me to The Fox Inn. There is something about this style that really jives with me, and it’s a shame that they are few and far between. As we paid our tabs I realized that the place was much busier than when I arrived. The bartender had been greeting people by name and almost everyone knew exactly what beer they wanted when they took a spot at the bar. This is clearly a place that regulars frequent and their well brewed beers must be the reason why. 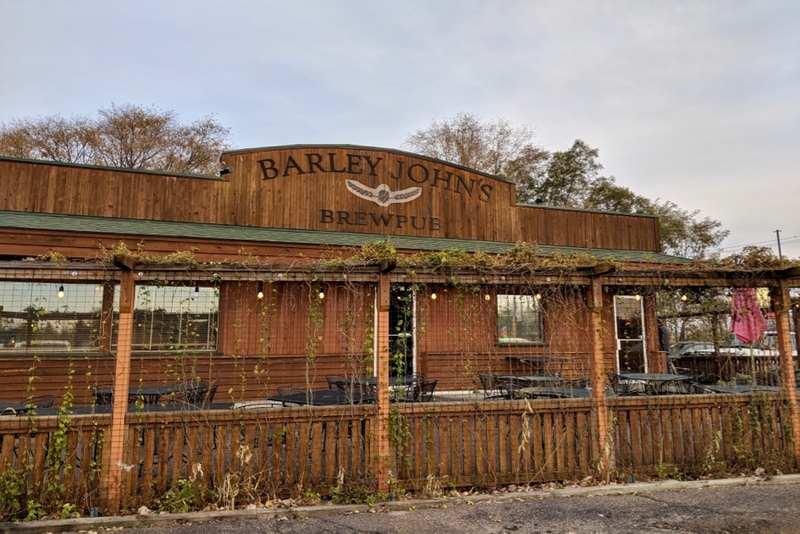 If you’re looking for a quiet spot to catch up with your friends then Barley John’s might be just the place.